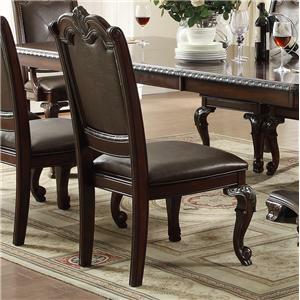 This stately dining side chair will make quite a statement in your home. The chair has elegantly curved cabriole front legs and a gracefully curving backrest. 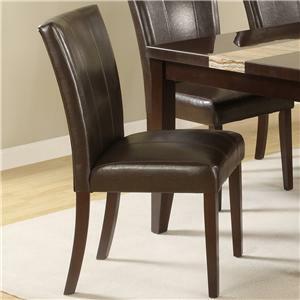 These soft curves, combined with the golden hued wood finish and upholstery, create a luxurious and appealing piece. The upholstered backrest also features diamond tufting, adding to the regal appearance of this side chair. The Mina Golden Upholstered Side Chair by Crown Mark at Casa Leaders Inc. in the Wilmington, Long Beach, Torrance, Lakewood, Los Angeles area. Product availability may vary. Contact us for the most current availability on this product. With smooth lines and muted, but rich colors, this collection is magnificent and will be a wonderful addition to your home. The side chair has cabriole legs and an upholstered seat with diamond tufting. The round table features a Lazy Susan, and an ornate base, blending a pedestal with legs. The Mina collection is a great option if you are looking for Glam Casual furniture in the Wilmington, Long Beach, Torrance, Lakewood, Los Angeles area.